Make sure to like our Facebook page to stay informed of the future panels! If you are not in Ottawa, you can watch the talk LIVE or watch the video later on our Facebook page. Like the page to get notifications to that effect. What: Dr. Monia Mazigh and lawyer Yavar Hameed will be discussing the double standard and the polical use of the word terrorism; the impact of islamophobia, anti-terrorism laws and national security agencies’ actions on Canadian Muslims; and how Islamophobia is both a cause and a consequence of Canada’s national security apparatus. Our National Coordinator, Tim McSorley, will be moderating, and we will have a Q&A after each presentation. Le panel sera en anglais mais vous pourrez poser vos questions en français. The event is FREE and open to everyone. We will be collecting donations in support of ICLMG’s work. If you want to know why you should give to ICLMG, check out our long list of achievements and gains since our creation in 2002. If you cannot attend, please consider supporting our work at patreon.com/iclmg or iclmg.ca/donate. 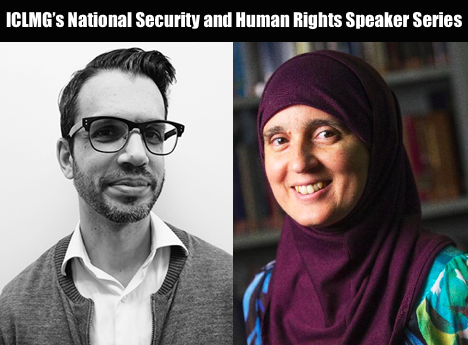 This panel is the second of the International Civil Liberties Monitoring Group’s National Security & Human Rights Speaker Series, sponsored by CUPE, the Canadian Union of Public Employees. ICLMG will be hosting one panel per month for 5 months on an important and timely issue related to national security and human rights in Canada. Stay tuned for the next dates and topics. Invite your friends and we hope to see you there. Thanks! This entry was posted in News from ICLMG on 13 October 2017 by ICLMG CSILC.